After years of waiting, Mac faithful can finally purchase an ultra high-resolution display made by Apple that not only mates quality with a competitive price tag, but comes with a capable built-in computer to boot. 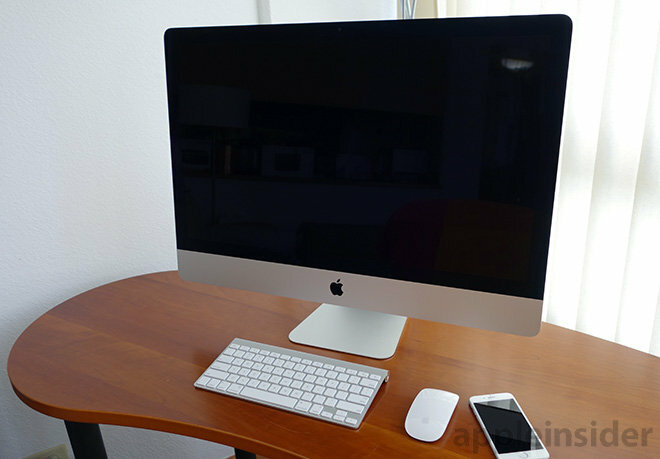 The iMac with Retina 5K display is a wolf in sheep's clothing. It looks like the iMac we all know —monolithic black glass, same silver "chin" —but flip the switch and 14.7 million pixels spark to life, instantly transforming the machine into one of the most innovative products to come out of Cupertino in recent years. We wouldn't hesitate to mention it and the Mac Pro in the same breath. Beyond design and usability, the new iMac has less in common with a vanilla iMac than it does the erstwhile 30-inch Cinema Display, Apple's high-end, no-nonsense monitor for professionals. While iMacs have always had decent screens, with relatively accurate colors and industry standard resolutions, the all-in-ones never really offered game-changing specs. Until now. Sat side-by-side and powered off, the iMac 5K is indistinguishable from a 2014 non-Retina 27-inch iMac. The designs are identical, and for the most part we're fine with that. That Apple was able to stuff a high-resolution display —5K no less —into the already svelte body of an iMac, which the company continuously touts as being "just 5mm at its edge," is an achievement in engineering. Of course, the iMac has a substantial hunchback into which fits the logic board, cooling system and memory, among other silicon components, but it's still mind boggling to think about all that technology shoehorned into such a small area. Speaking of memory, the DIMMs are thankfully user replaceable from a rear port just below the fan vent, covered by a panel flush with the curved rear chassis, identical to previous iMacs. A push button mechanism that levers the panel out from the inside can be accessed through the power port, but only when the power cable is removed. A good design as computers should always be unplugged when adding or swapping out RAM. 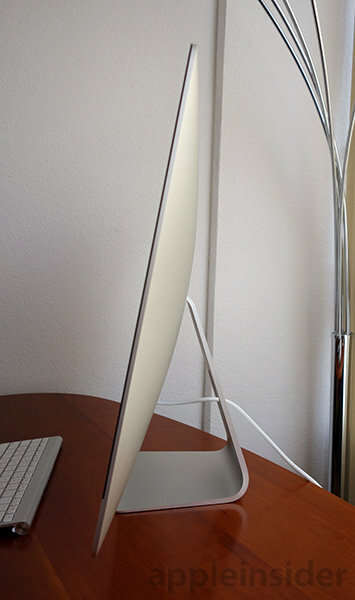 Propping up the large screen is Apple's tapered aluminum pedestal, devoid of ornamentation except for a round cutout for cable management. Ringing the stand's foot is a generous patch of rubberized material to prevent skids and wobbles. Operationally, the tilt adjustment clutch is buttery smooth, requiring only one finger to move the massive 27-inch panel into position, but exerting enough friction to keep it positively locked in place during use. For an extra $40, users can opt for a VESA mount adapter for articulating arms and wall hanging, but the configuration comes sans pedestal stand. The obvious star of the show is the iMac's super high-resolution Retina 5K display. Apple includes "5K" in the computer's official name to delineate it from Retina branded panels found in the MacBook Pro, iPad and iPhone. And for good reason. This screen is in a different class entirely. At 5,120 pixels-by-2,880 pixels spread across a 16:9 27-inch diagonal panel, the Retina 5K packs in just over 217 pixels per inch over an area of 311 square inches. That's 14.7 million pixels. A tad less pixel-dense than a MacBook Pro with Retina display, Retina 5K is bordering on overkill considering most users will position the desktop farther away than a laptop. From where we're sitting —more than two feet from the iMac's screen —it is impossible to pinpoint individual pixels. An example of the 5K Retina's level of detail, the new modified Myriad typeface Apple now uses on its website is incredibly crisp, with no sign of pixelation on curved glyphs or blur in crevices created by serifs. A lot of focus is put on detail rendering, but just as important is light distribution, color accuracy and brightness. Testing showed good off-axis viewing thanks to what Apple calls Compensation Film, likely a specialized thin film polarizer, which is used to ensure consistent contrast and color across a wide range of viewing angles. To our eyes, the 5K Retina is a huge improvement over Apple's Thunderbolt Display and vanilla iMac models, which already sport great off-axis performance. 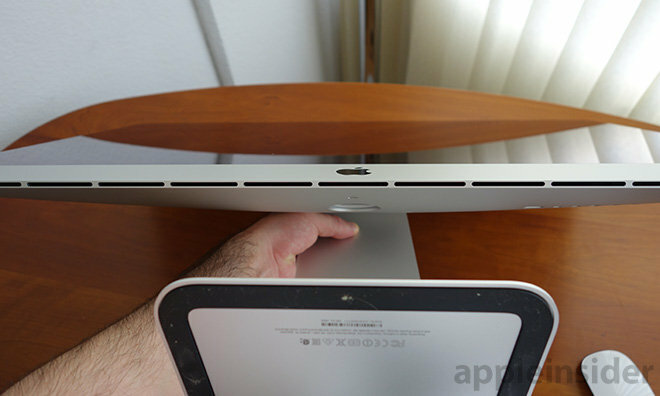 Adapting to Retina 5K will fundamentally change how you use a computer. One shortcoming normally associated with high-density displays is poor illumination, but not so with the iMac. Upgraded LED backlighting includes energy-efficient modules, which Apple claims to achieve output equal to or better than a non-Retina iMac with 30 percent less energy. In a side-by-side test with our 15-inch Retina MacBook Pro, the iMac was noticeably brighter when both were set to maximum brightness. Backlighting was also extremely even, with no hot spots or light leakage that were problems with Apple's legacy large-format flat panel displays. In addition, the cover glass is laminated to the LCD stack for inky blacks and enhanced shadow detail. In short, this is a pro-grade panel, up there with the best standalone products from Sharp and the rest. Like our first experience with a 4K monitor for Mac —Sharp's PN-K321 paired with Apple's 2013 Mac Pro —the extra screen real estate felt daunting at first. Large screens, however, allow for more windows to be open concurrently, which can translate to a more efficient workflow. Retina 5K takes that idea to the extreme. 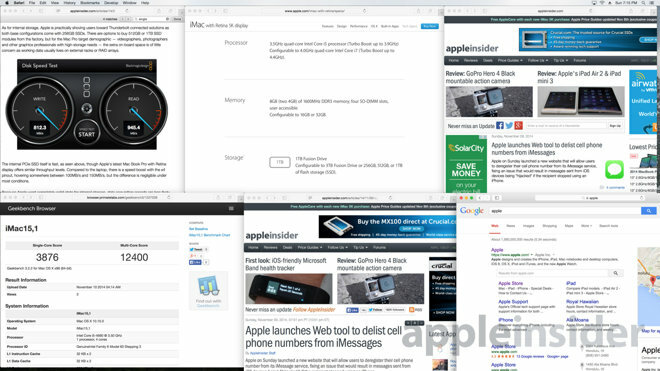 For example, we were able to open six Safari windows arranged edge-to-edge, each with highly legible content. Even more exciting is the prospect of editing 4K video at full resolution without the need to scale down to access tools or the timeline. 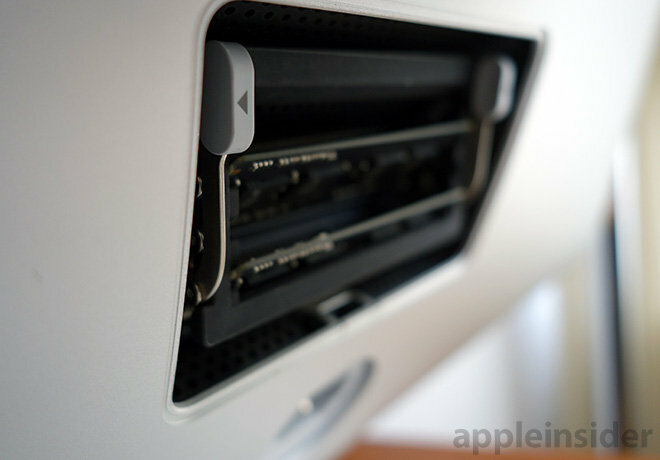 Adapting to Retina 5K will fundamentally change how you use a computer. Our iMac testbed came loaded with Intel's Core i5 CPU clocked at 3.5GHz, with supported Turbo Boost up to 3.9GHz. A 4.0GHz quad-core Intel i7 chip with Turbo Boost up to 4.4GHz and support for HyperThreading is available for an additional $250. Apple didn't make the jump to Intel's next-generation Broadwell architecture for the iMac 5K, but the Haswell CPUs used are newer SKUs than those offered with non-Retina iMacs. Under low strain —Web browsing, light photo editing and general productivity apps —the base configuration is snappy. We would say performance is more than enough for regular consumers. On Geekbench, the iMac notched a multi-core score of 12,400 under a 64-bit testing regime, higher than non-Retina iMacs, but below a quad-core version of Apple's Mac Pro workhorse. 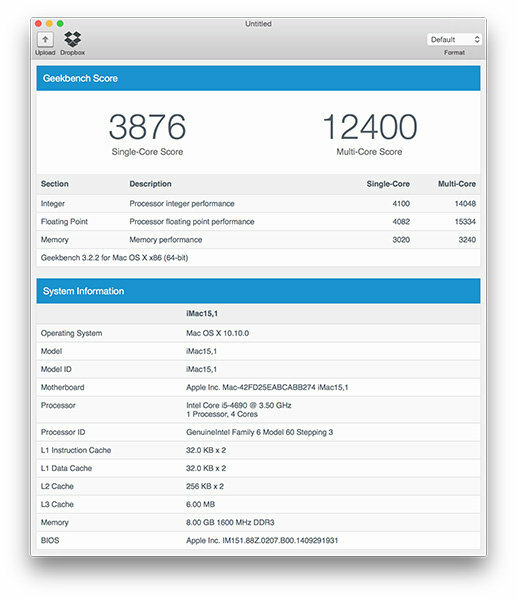 The iMac did come out ahead of the base Mac Pro in the single-core test, with a score of 3,876 compared to 3,604. Graphics were similarly on par with non-Retina iMac models and we noticed zero stutter or lag when running through intensive tasks like 4K video editing. The AMD Radeon R9 M290X GPU with 2GB of GDDR5 RAM kept up with most operations, showing signs of strain —lower frames per second —only when adding multiple congruent effects to high-resolution video. The base iMac has enough horsepower to pump out video to a 3,840-by-2,160 pixel display while simultaneously running native 5K on the Retina panel, but we were unable to test the feature. Under normal workloads, the machine is nearly silent, but fans start to spool up when cutting video or opening an app that hijacks system controls (like GoPro's buggy video editing suite). Our unit came equipped with a 1TB Fusion Drive, a hybrid system that keeps regularly used files and apps on a speedy SSD and other data on a spinning HDD. 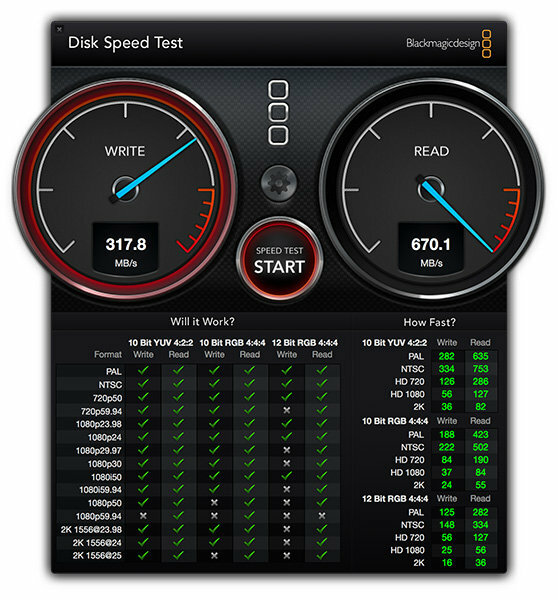 Testing with a tool like Blackmagic's Disk Speed Test rendered lower read/write times than expected, but we believe the temporary data was cached to the HDD rather than flash. During normal operation, the iMac is fast enough to keep up with real-time 4K video edits, leading us to believe the dynamic file transfer system works. Along with Fusion Drive and Apple's SSD configurations, the iMac 5K comes with two Thunderbolt 2 ports, as opposed to plain Thunderbolt on the non-Retina iMac, making connected storage options a viable alternative for realtime content editing. Up to this point in testing, we found everything about the iMac 5K to be stellar, but there is one glaring issue specific to the base model configuration that needs to be addressed. As mentioned above, the expansive screen engenders a workflow not constrained to two or three open windows, but many. 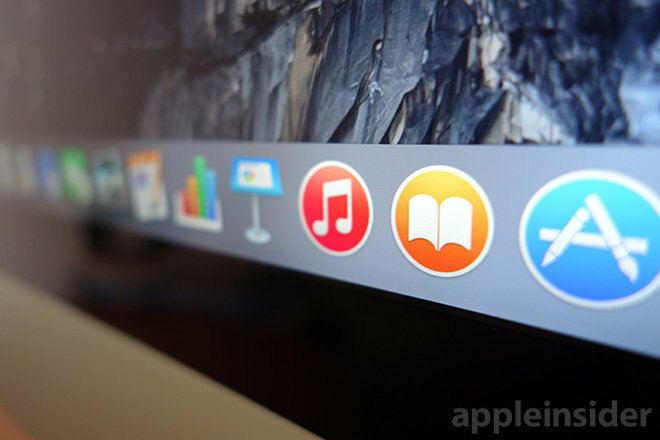 Multiple open apps chew up memory resources even with OS X's advanced task optimization. The standard 8GB allotment is simply not enough, a fact exacerbated by running more than one intensive image editing operation at once. According to the OS X Activity Monitor, we hit the physical RAM limit using only Apple's first-party apps, for example combinations of Safari, iPhoto, iMovie, Numbers and iTunes. Admittedly, Safari took up a large chunk of memory thanks to content-rich webpages, but the ease at which we hit the virtual ceiling was troubling. Memory swapping helped keep things smooth with low intensity tasks, but the situation got dicey when once we started batch processing images in Photoshop while rendering Final Cut Pro X effects in the background. Throwing high-res photo editing into the mix, our system started to sputter. For daily duties, the base RAM configuration is fine, but professionals will want to start out with more. Luckily, the iMac's memory is user-serviceable, meaning owners can add in or swap out four DIMMs to total up to 32GB of addressable memory. Customers can configure RAM options through Apple, or save some money and purchase aftermarket modules. For reference, our iMac came with two 4GB SO-DIMMs manufactured by Micron Technology. Cramming components into a thin profile chassis comes with its own flavor of self-imposed restrictions. 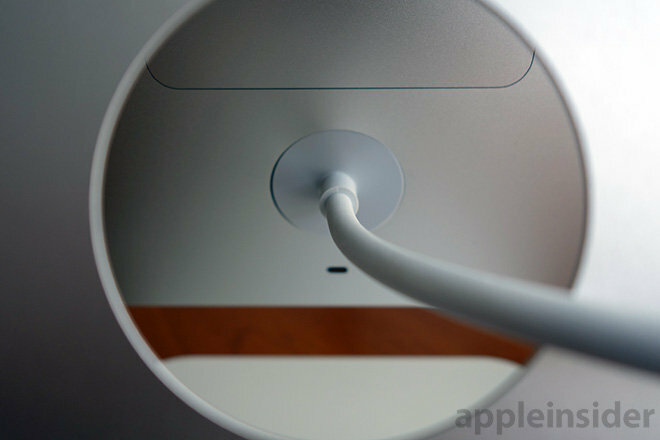 Apple uses down-firing speaker ports to bounce sound off a desk or work surface and toward the user. This makes for a nifty setup, but for a computer of this size sound is slightly anemic. Still, when considering the constrained internal space and relative size of the iMac's speakers, output is sufficient for watching movies and listening to music. The speakers are clear, crisp and accurate, but the iMac is no bass monster. A well thought out balance has been reached between consumers and pro users, keeping design overhead, and thereby end-user pricing, to a minimum. Regular users won't be wowed by the iMac's sound, but they won't be disappointed, either. Professional videographers and music makers will most likely rely on their own external monitors, bypassing the internal stereo drivers altogether. Rounding out the iMac 5K are all the trappings from the non-Retina version, including HD FaceTime camera, dual microphones, 3.5mm headphone/optical digital audio output jack and an SDXC card reader. 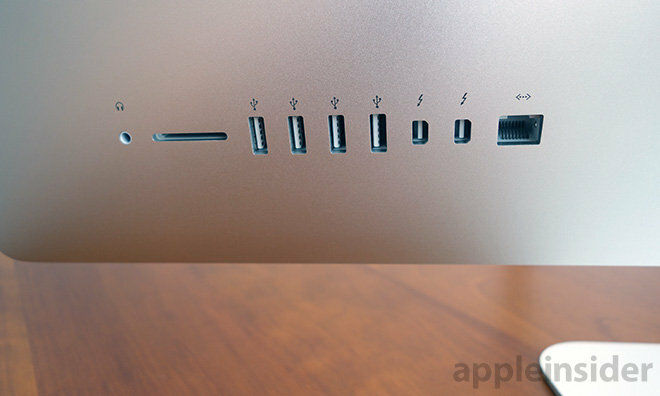 Expansion options include four USB 3.0 ports, two Thunderbolt 2 ports and Gigabit ethernet. On the connectivity side is 802.11ac Wi-Fi support and Bluetooth for taking advantage of OS X Yosemite's Continuity features, including app Handoff, phone dialing using iPhone and AirDrop to iOS 8 devices. From the moment you power on the iMac with Retina 5K display and are met with OS X Yosemite's familiar Apple logo rendered in crisp relief, it is exceedingly clear that Apple has built something special. Memory issues aside (easily remedied with add-on RAM), the Retina iMac is not only Apple's best all-in-one desktop, but a contender for the title of best Mac, period. It may not be the powerhouse that is the Mac Pro, and is definitely the least portable Apple product, but the iMac 5K brings a lot of tech to the table in a manageable package, ticking off wish list items for consumers and professionals alike. Apple didn't make many concessions when squeezing the high-density Retina display into the iMac's skeleton; no processor nerfs or stripped-down internals to keep thermal overhead in check, no chassis modification to accommodate existing LCD technology. 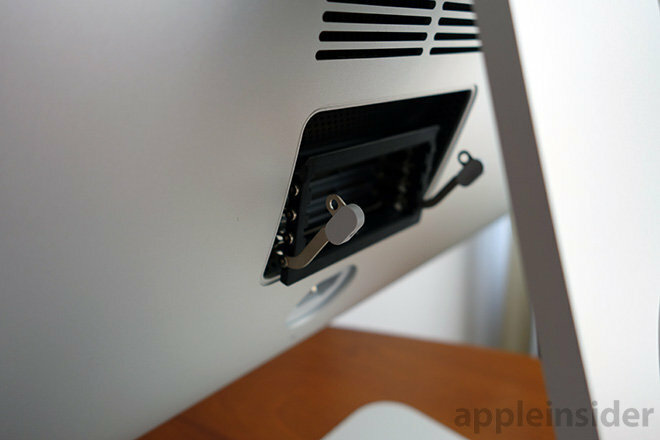 This iMac is an exercise in innovation. Even the base model is kitted out with proper silicon tailored to appease the needs of imaging professionals, the demographic most likely to benefit from native 5K resolutions. In the end, everyday users will want the higher resolution display for video viewing, a bigger workspace and future-proofing. But for professionals, this is the iMac you need. 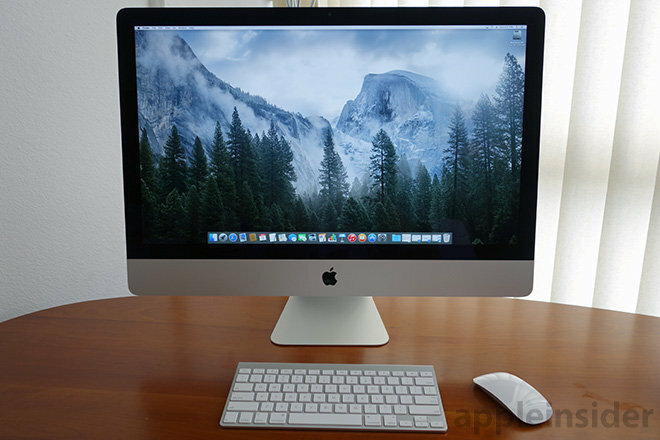 Apple's 27-inch iMac with Retina 5K display starts at $2,499 (configuration tested) from the Online Apple Store, but Apple Authorized Reseller B&H Photo offers the same model for $2,349.00 with the added benefit of only collecting sales tax on orders shipped to NY, meaning readers outside NY will likely save another $200+ in tax. This is currently the lowest net price for this model anywhere, but always double-check our Price Guides (also below) to be certain. Readers looking other configurations of the new iMac should also check out our Mac Price Guides and Macs with AppleCare Price Guide for a list of discounts, deals, and promotions surrounding specific build-to-order configurations.